The other day we got our first look at what’s likely to be the Pixel 2 XL and now we have information on some of its key features, including a squeezable frame and an always-on screen. 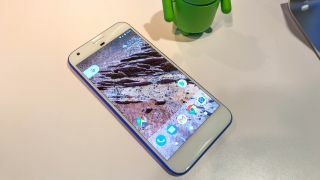 Starting with the frame, we’d already heard rumors that you’d be able to squeeze the sides to control aspects of the phone, a bit like you can on the HTC U11, and now “a source familiar with the matter” speaking to XDA-Developers has revealed that one of the things you’ll be able to do is squeeze to launch Google Assistant, whether the screen is on or off. You’ll also apparently be able to adjust the squeezing intensity threshold, so you can find a comfortable level of pressure to activate it. And it probably won’t just be used for Google Assistant, with the source adding that extra functionality, such as the ability to silence calls with a squeeze, is likely to be added too. Next up, the screen. We’d heard that this would be a 5.99 or 6.0-inch OLED one supplied by LG, and this source agrees with that, but adds that it would have an always-on feature, so you can see key information like notifications and the time even when the screen is otherwise off. That’s a feature we’ve seen on other phones such as the Samsung Galaxy S8, and like the S8 you’ll apparently also be able to customize the display settings, with a new ‘Vivid Colors’ option being added to the mix. Finally, the source adds that the UI’s color palette will use the darker theme that’s been seen in earlier Android O developer previews, rather than the light theme that’s popped up in a more recent one, and that there might be a new system font. While we can’t be certain of any of this information, XDA-Developers claims to be confident that it’s accurate, though notes that software features could always change before launch. And that launch is getting ever closer, with October looking likely.